Bioderma Atoderm Moisturizing Milk is designed to adults, children and babies with dry and sensitive skin, it moisturises and protects. It reinforces the hydrolipidic film of skin and durably protects skin, thus restoring its natural barrier function. 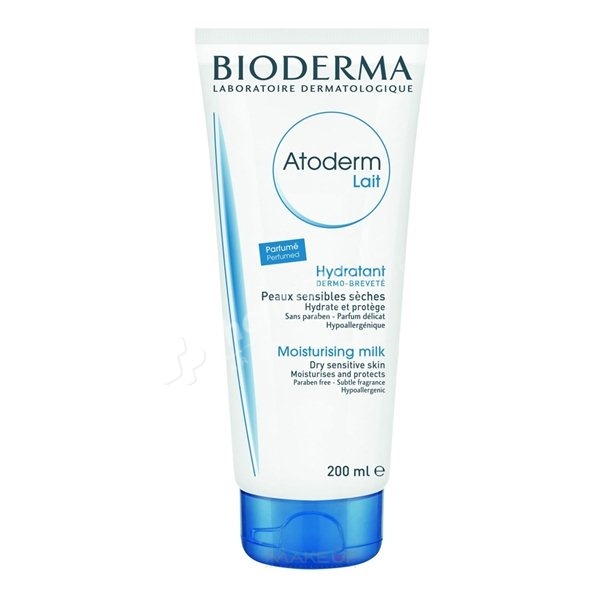 Bioderma Atoderm Moisturising Milk is designed to adults, children and babies with dry and sensitive skin, it moisturises and protects. Ultra-tolerant, it can be applied to the body as well as to the face.The highly moisturising formula of this milk procures a maximum hydration. It reinforces the hydrolipidic film of skin and durably protects skin, thus restoring its natural barrier function. Atoderm Milk respects the cutaneous balance and the natural patented D.A.F complex increases the tolerance threshold of the most sensitive skin. The fresh, light and delicately scented texture of this care in instantly absorbed, for immediate comfort and a feeling of genuine well-being. Re-hydrated and durably protected, the skin recovers comfort, suppleness and softness. Apply Atoderm Milk once or twice a day after cleansing skin, ideally with Atoderm Ultra-rich soap.